"As the World Turns" was a popular tv show back in my school days. I think I could write an equally gripping tv show today about compost. Well maybe not equally gripping but at least somewhat fascinating. Just when i thought all the work was done for the fall I came up with a new idea. This time it was a piece of leftover hardware wire that triggered the thought. I bought a bigger roll of wire than I really needed to build that simple compost screen. What was I going to do with the extras? My husband proposed making a circle of wire . He suggested we could just tie it together loosely and dump our piles of leaves in it as they fell off our Qualicum Beach Catalpa tree. We had the good idea and then we left town - leaving my 88 year old mother and her 90 year old sister in charge of the project. Well- the first thing that happened was the leaves got heavy as it rained and the girls were simply working too hard packing them down so the wire started to split apart where the circle was joined. They then reinforced our simple loop with wire ties and propped up one slack side with bricks and anchored the whole works around a big rock so it wouldn't tip over. Then they kept adding leaves. When I arrived back on the west coast I was surprised to see how great the system was working. So great- in fact- I decided to screen my other tumbling compost (which is completely finished) and add the screened compost to the top of the leaves. I probably should have been adding compost all along in layers as the leaves were added but remember I was away and there is only so much you can ask of an aging mother. (Believe me - I know- I am an aging mother too). 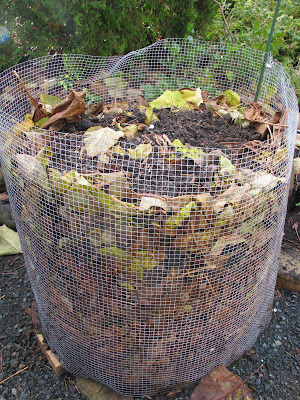 So the system sits, waiting for the last leaves to fall complete with a capping of compost. I look forward to seeing how far it progresses by spring. Will it be ready for potato planting or spreading on the garden?